Developing the required spatial input layers. Setting targets for biodiversity features. Analysing the data using biodiversity planning software and GIS. Map of critical biodiversity areas. Handbook with land and resource-use guidelines. Critical biodiversity areas are terrestrial and aquatic features which are critical for conserving biodiversity and maintaining ecosystem functioning and should thus remain in their natural state. It is important to allocate enough time and resources to the development of the products and it is often worthwhile getting professional input on product design. An up-to-date land cover map indicating areas remaining natural and areas where no natural habitat remains due to for example agriculture, afforestation, urban development and mining. Spatial information on biodiversity pattern (ecosystems and species); for example vegetation types, river types, wetlands, estuaries, and species distributions for endemic and threatened taxa. Spatial components of ecological processes; for example high-yield water areas and riverine corridors. Current and future land-use pressures. Not all spatial data is useful for biodiversity planning purposes and it is important to consider the usefulness of existing data before spending time and resources on acquiring it. Expert knowledge is crucial in the biodiversity planning process, but it must be applied within a systematic framework. The next step is to set quantitative biodiversity targets for biodiversity features, indicating how much of each feature is required in order to conserve a representative sample of biodiversity pattern and key ecological processes. Biodiversity targets can be set for features like vegetation types as well as for species and populations. In South Africa the species-area relationship method has been used for setting baseline targets for vegetation types. 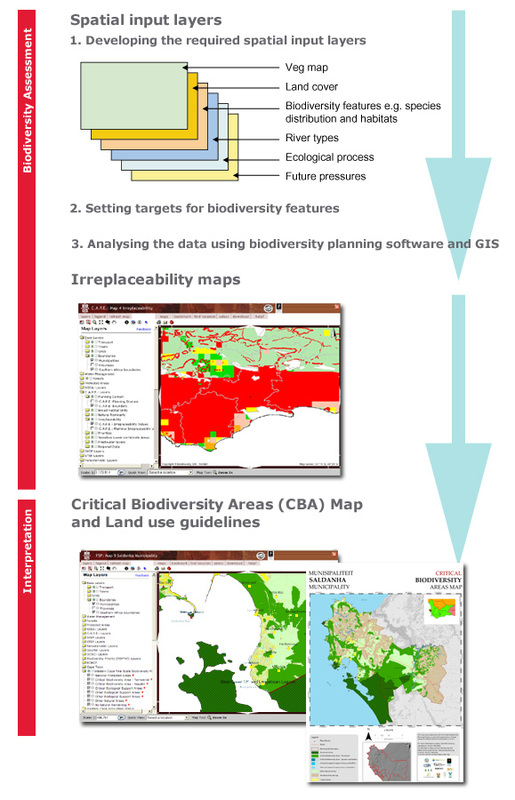 The spatial data layers together with the biodiversity targets are analyzed using biodiversity planning software (for example C-Plan or MARXAN) together with a GIS to identify priority areas for biodiversity conservation. The biodiversity planning software summarizes the options that are available for meeting biodiversity targets in the landscape. These options are displayed spatially as an irreplaceability map.